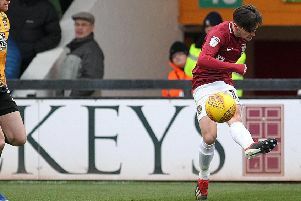 Lincoln City manager Danny Cowley was not all smiles despite his side’s thrilling 3-2 win over the Cobblers in round one of the FA Cup at Sincil Bank on Saturday. The Imps boss was disappointed by some of his side’s defending that allowed Northampton to get back into the tie after Harry Anderson and Tom Pett had put the home side 2-0 up 10 minutes into the second-half. Jack Bridge squeezed a shot past goalkeeper Josh Vickers to slash the deficit to one and then Kevin van Veen equalised late on to put the tie on course for a replay, only for Bruno Andrade’s fine strike to pinch it for Lincoln. “We have to defend better than that if we want to be successful this season because we can’t keep conceding two goals at home no matter how well you play,” Cowley told the club’s website. “Our offensive play today was excellent but if we are good team we should be coming away from that winning three or four nil. “I am really pleased about the fact that we are through and the final outcome of the game but we know the process has to be better. “Once we’d got it back to 2-1, we had got a foot back in it and we took control of the game but they’ve scored in that moment. From that point on when you are at 2-2 you are looking and thinking it will be one of those FA Cup games which goes against you. “We’ve done very well to pull a rabbit out of the hat and find a win. We’ve got to go back and work really hard in the two weeks we’ve got on the grass, especially on the defensive aspects of our game. “What’s frustrating is that we aren’t giving any chances away, nobody is opening us up and it just seems to be that everything they hit is going in at the moment. We’ve got to look at it and defend both goals better.